It’s as bad as it sounds. And by bad, I mean oh so good. 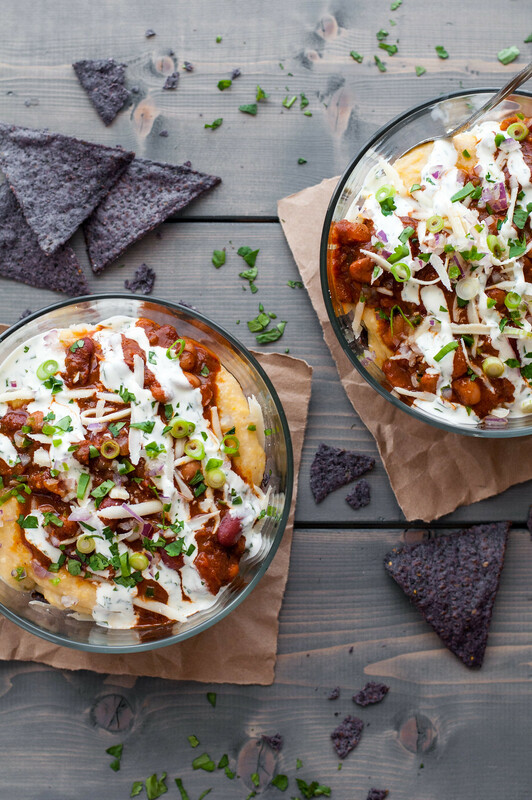 Seven layers of southern and Tex-Mex comfort food rolled into a single, build-your-own game day or party dinner bowl. 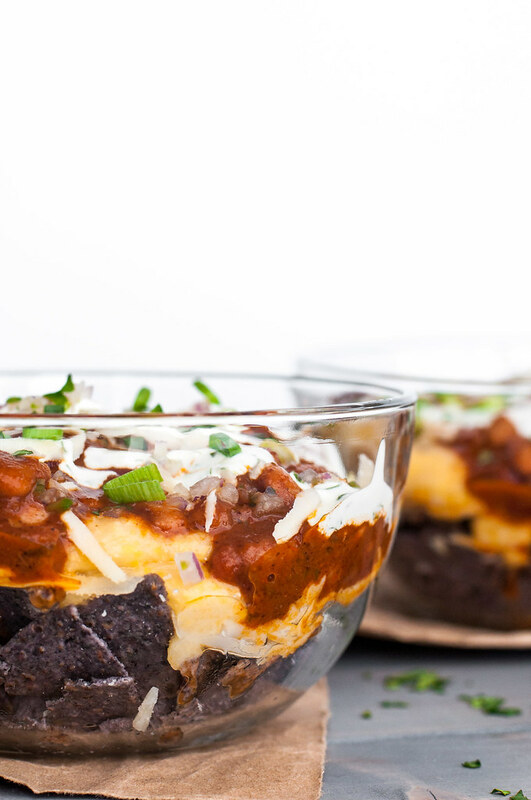 Even though, for once, I’m on my special events game with the timing of this recipe, these bowls really are super any time of year, cutesy name or not. Today’s post features 3(!) recipes and lots of pics, so I’m going to try to keep my narrative short, but I do have to tell you the story of how these over-the-top creations came to be. It all started at Picasso Cafe, on my first trip to visit the now Mrs. Hambright and husband (congrats guys!) in OKC. This place was the best of all worlds–hometown bar feel where both regulars and out-of-towners feel comfortable mingling together; a mix of coastal favorites, comfort food, and Tex-Mex that I would never have expected but somehow offered a cohesive, exciting menu; and the most reasonable prices and huge portions you could ask for. 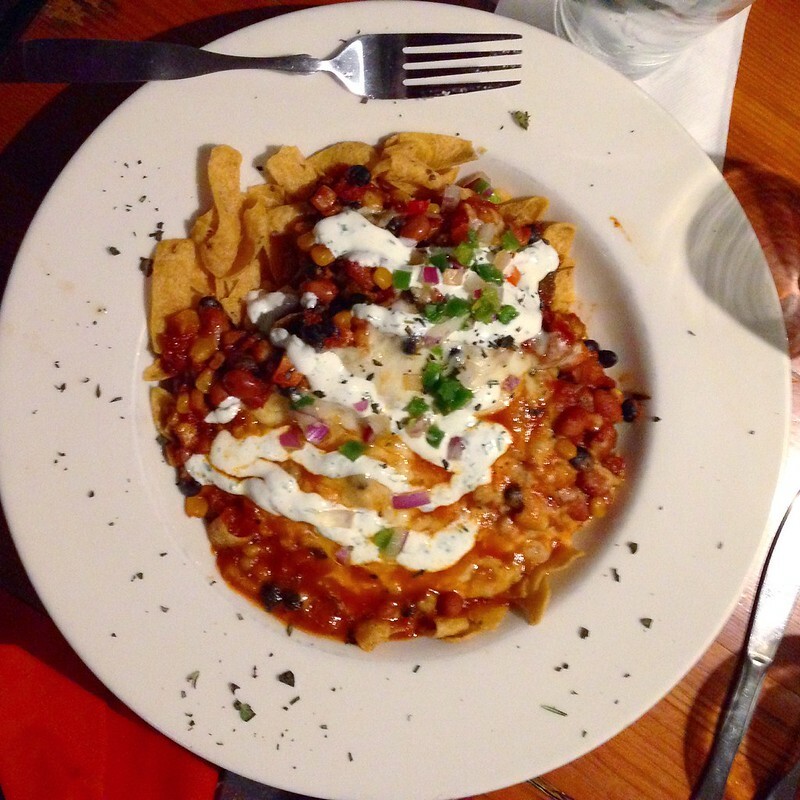 I’ll spare you my full review, but I ordered the vegetarian Frito chili pie (above) for dinner and reacted like a kid on Christmas morning when it arrived. I wasn’t sure what format to expect, but what I got was a pile of Fritos, vegan chili, more Fritos, provolone cheese, and all the fixings. Sometimes at a restaurant, you know without a doubt that you made the best pick at the table–that was me. One of the highlights of the dish was the juices of the chili seeping into the crunchy Fritos below, softening them into a desirably soggy “crust”. The pie went on my “to blog” list immediately. I thought Fritos would work–they’re vegan and a critical component of the original recipe. Then guilt started to creep in. I’m not perfect, but I advocate, and try to eat, as few processed foods as possible, especially foods made by companies throwing millions of dollars at advertising and other measures meant to confuse the public and keep us eating these processed “vegan” foods filled with questionable ingredients, or whole-sounding ingredients of the worst possible quality. I knew I had to do better. And guess what–I one-upped those Fritos, hands down. I had to keep the crunchy, chili-soaked chips, so I improved on color and health by upgrading to organic blue corn tortilla chips with just a few ingredients. To make up for using only a handful, as opposed to half a bag, of chips, I pulled this jalapeno cheddar grits recipe out of my vault to add bulk and a creamy counterpart to the rich chili. 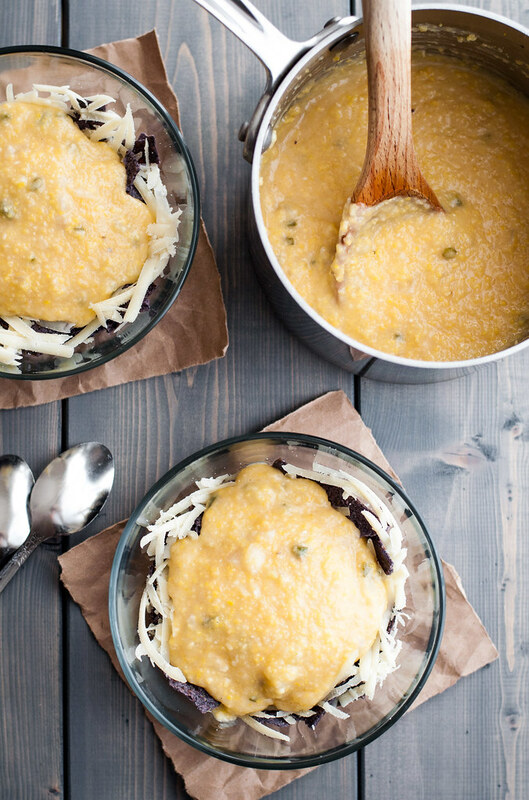 Grits may sound like an intimidating proposition if you’re not from the south (I’m not, and they did), but these things cook in just 10 minutes and, unlike very slow cooking Italian-style polenta, are near impossible to screw up. So how, exactly, does one pull off this multi-component bowl on game or party night? It need not be overwheming. First, make the chili in advance, then refrigerate it for a few days or freeze it for months. 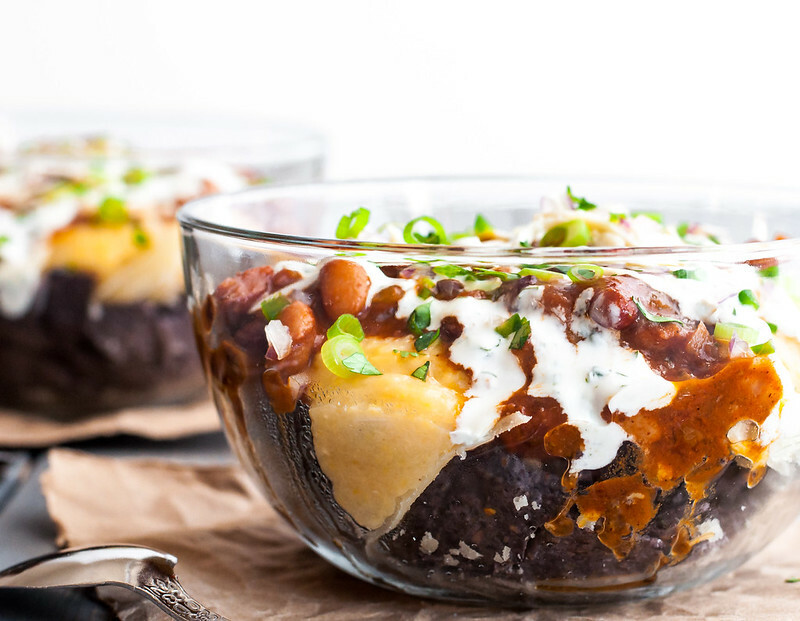 The all-bean chili here is simple and doesn’t require half the produce section, but if you like, substitute your own famous chili recipe (or try my beet chili). Better yet, delegate someone else to bring a crock pot full of it! Second, prep all the fixings–everything but the chili and grits–the night before or the morning of your gathering. The most fun setup is for everyone to build their own bowl, so put each topping in its own container. No need to be fancy (unless you want)–regular old bowls or disposables will work just fine. Finally, make the grits fresh, just before serving. If you chop the onion and pepper, grate the cheese, and measure and lay out all the ingredients ahead of time, the cooking process will take no more than 20 minutes, and you’ll have a nice pot of super fresh, ultra creamy grits that ooze over the chips and cheese in each bowl. For every eight people, make one recipe of the below chili and a double batch of grits. Set up a buffet line for the bowls as follows, making sure to have extras of all the ingredients since everyone will choose their own serving size. You may want to give a quick demo, or have a rough diagram of assembly (or, if you are fancy with a color printer, print out one of the photos from this post–but please, only one, and do not use it outside of your home). There you have it! Super bowls for the super bowl. I have no idea where I’ll be watching the game, but way more important than the matchup, I know I’ll be sipping a cider beer, eating lots of jalapeno poppers, and celebrating the close of football season and many coming weeks of productive Sundays. 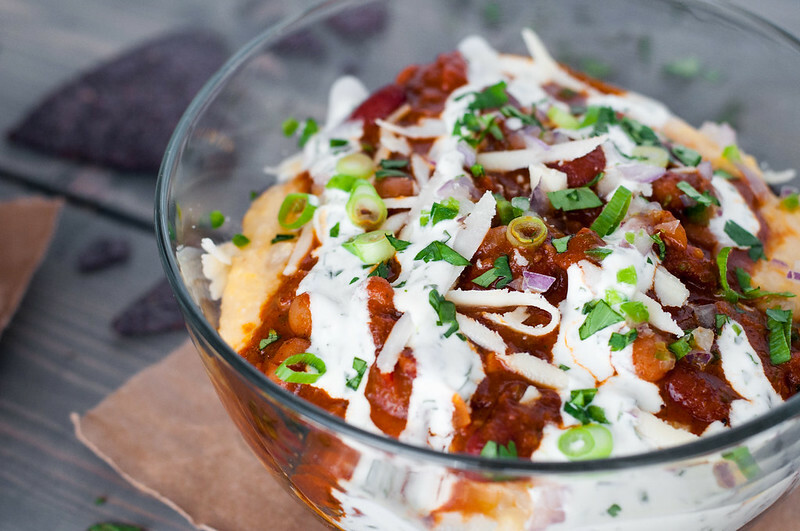 Click to jump to the chili or grits recipes. Dietary Note: When serving those with Celiac Disease, always confirm that each of your ingredients is gluten-free. I’ve categorized the recipe as gluten-free based on the ingredients I purchased, but individual brands may vary. 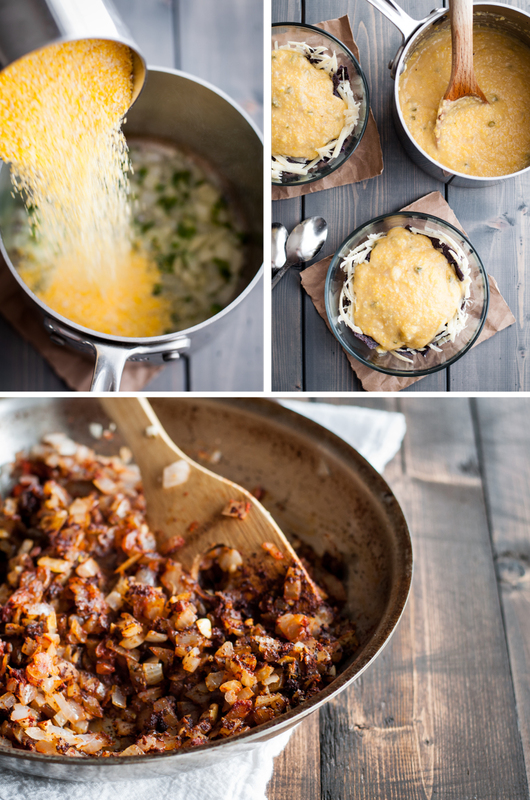 If made ahead, warm the chili and the grits. I recommend making the chili ahead but making the grits fresh, so they don't solidify. Combine the sour cream, chopped cilantro, and lime juice to make cilantro-lime sour cream. This can also be made ahead. To serve, roughly crumble ¼ of the chips in each of four bowls. Sprinkle a scant ¼ cup of grated provolone (or lay one slice) over the chips, reserving about ¼ cup of cheese (or two slices total) for the end. Before proceeding, you may warm the chips and cheese up to 10 minutes in a low (175 degrees or lower) oven, if time permits. Scoop a generous helping of cheddar grits over the chips and cheese, followed by a scoop of bean chili. 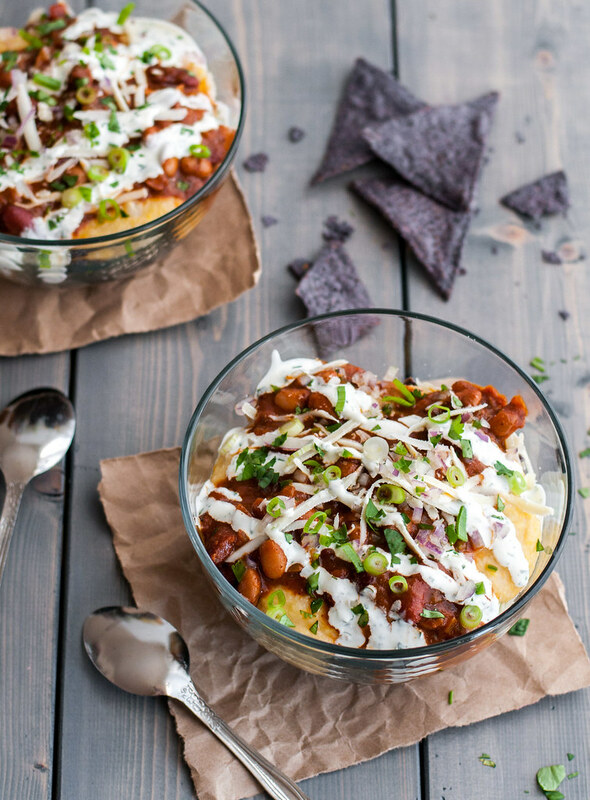 Sprinkle each bowl with remaining provolone (about 1 tablespoon grated, or ½ slice), drizzle with cilantro-lime sour cream, add a bit of red onion and jalapeno, if desired, and serve with any other garnishes at the table. Cook times assume that chili was made in advance but grits were not. 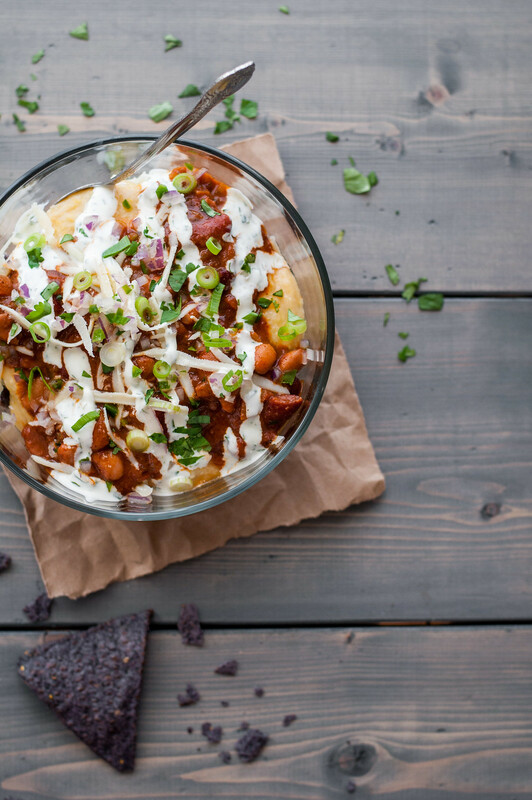 It's back to basics with this earthy, smoky chili. Unike some (of my) veggie chili recipes, the ingredient list is mostly found in your pantry and doesn't call for an expensive slew of every vegetable under the sun. Soak dried beans (both varieties together) overnight or at least 8 hours in a large bowl with at least 1½ quarts cold water. Drain beans and bring to a boil in a pot of 4 quarts water and 1 tablespoon salt, or the epazote, if using. After 10 minutes, remove any dirty, filmy looking bubbles with a wooden spoon. Reduce heat and simmer the beans partially covered as you prepare the rest of the recipe. In a medium skillet, heat vegetable oil over medium, then add onions and cook until barely softened, 7 to 8 minutes. Add next 5 ingredients, plus 1½ teaspoons salt. Reduce heat to medium low and cook, stirring constantly, until onions are softened, about 5 minutes. 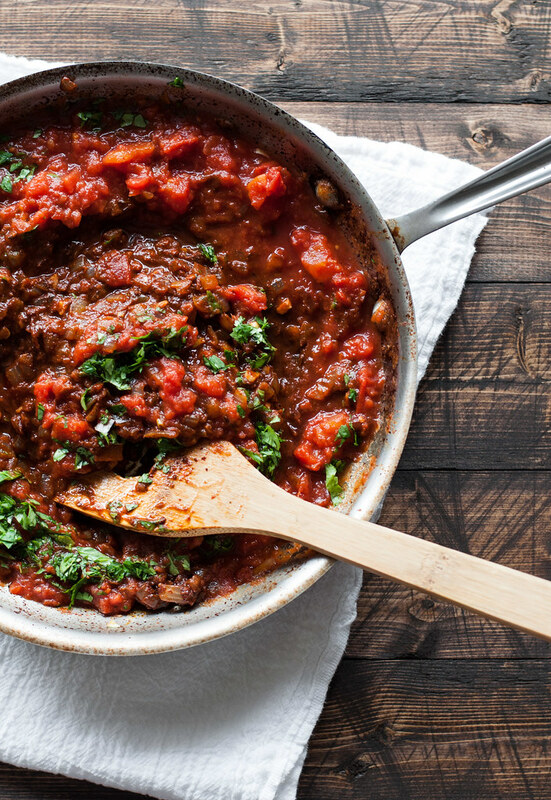 Add tomatoes, chipotle chili puree, and cilantro and increase heat so the mixture simmers gently. Turn off heat after 15 minutes and stir in the masa. Remove 4 cups of cooking water from the beans (freeze for later use in soups or other chilis), using a ladle or liquid measuring cup. Transfer tomato and onion mixture into the pot with beans, and simmer uncovered until reduced to desired thickness, about 45 minutes for a thicker chili. Cool chili for 5 minutes, then taste and season accordingly with salt (I used 1 teaspoon) and a splash of sherry vinegar for brightness. The chili does best made in advance. It can be refrigerated for about 4 days or frozen for months. Refresh the flavor with salt, if needed, and a splash of sherry vinegar or lime juice. Unless you have experience or lots of confidence, I don't recommend substituting pre-cooked beans, as it will significantly alter cooking times and required liquid volume. Epazote is a dried Mexican herb often cooked with beans. It doesn't smell great, but, when cooked with beans, it can help with the smells you'll produce after eating them. I didn't have any when I tested the recipe (and it turned out great), but I ordered some and will use it and report back next time. Adapted from All-Bean Chili in Deborah Madison's Vegetarian Cooking for Everyone. The recipe is described as I made it, with the ingredients and quantities I used. However, chili, in my opinion, is not an exact science. Feel free to make substitutions (oil or vinegar type, regular paprika, a different kind of onion, added vegetables) and let me know how they came out! I'm far from southern, but regardless of any grits tradition I've violated with this indulgent recipe, it's quick comfort food that should have anyone coming back for more. Melt butter in a medium saucepan over medium heat. Add vegetable oil and heat 30 more seconds. Add onion and jalapeno and cook until softened but not browned, about 5 minutes. Reduce heat and stir in grits until coated in the oil, resembling moist crumbs. Add broth, stock, or water, stir, and increase heat to just bring to a boil. Cover and reduce to lowest heat. Cook 10 minutes, stirring once or twice to ensure grits don't stick to bottom of pan (if that happens, they should loosen when scraped off with a wooden spoon). Taste grits to make sure they don't taste raw. If texture is very thick, add another quarter cup of liquid and simmer uncovered until mostly absorbed to achieve a more fluid, creamy texture. Add half and half and stir to combine, then simmer uncovered for a couple minutes, until just absorbed. Remove from heat and stir in sour cream and cheddar, one at a time, until incorporated and the latter is melted. Season with salt and pepper to taste. Serve topped with scallions, if desired. Note: this page may contain affiliate links. It does NOT contain sponsored content. Affiliate links offset my food and website maintenance costs, so I can keep bringing you kick@$$ recipes like this one. Thanks! That’s what I was going for–thank you ladies! Love the flavors you’ve got going on here. Oh my word! 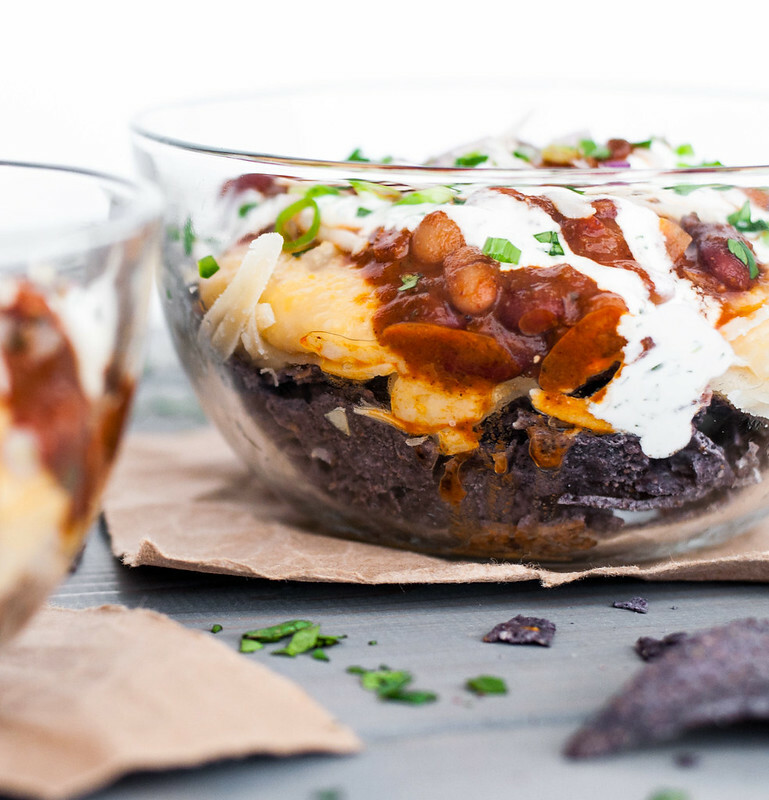 Tessa, this looks amazing and I have found our meal for the Super Bowl! Excellent, thanks for sharing. Sally, hope it went over well! I’ll definitely be repeating this one long before next year’s super bowl.